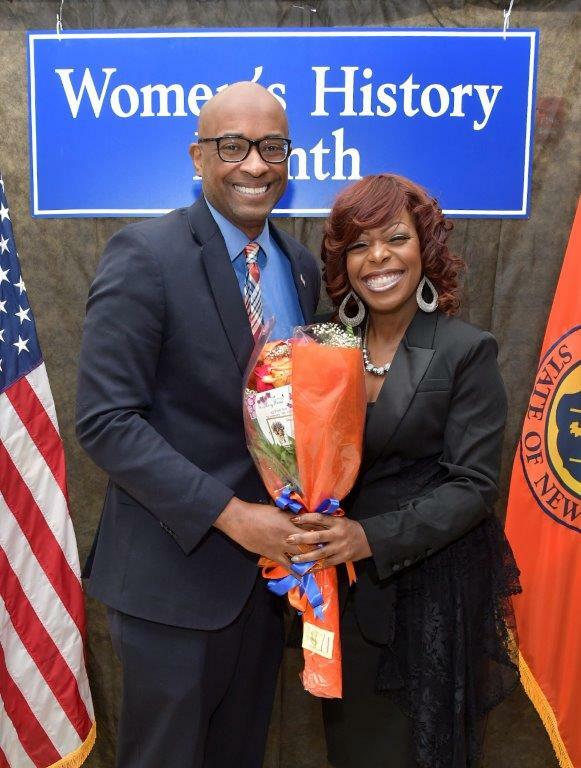 Nassau County Legislator Kevan Abrahams (D – Freeport) honored Lynnette Carr-Hicks, the creator and founder of Uniondale High School’s nationally and internationally acclaimed “Rhythm of The Knight” show choir during Nassau County’s 21stannual Women’s History Trailblazer Awards ceremony on Monday, March 25. Lynnette Carr-Hicks, who earned a B.S. in Music Business and Vocal Performance from Berklee College of Music and a M.S. in Music Education from LIU Post, applied her background in music studies to elevating the Rhythm of the Knight show choir. Under Lynnette’s leadership, the Rhythm of the Knight captured the grand championship at the Fame Show Choir National Championships Series in Chicago, making this the first majority-minority show choir to earn the title. As a result of her hard work and dedication, Lynnette was inducted in the Long Island Music Hall of Fame as an Educator of Note, making her the first African-American educator to be honored in this manner. The show choir has gained national and international acclaim and has been featured performers on NBC’s “Today,” the syndicated “Steve Harvey Show,” FOX 5 New York’s “Good Day New York” and CNN, to name a few.